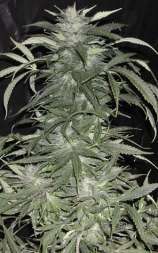 Here you can find a strain description about Sweet Tooth (BC Bud Depot) and also some user-based reviews and infos directly from the SeedFinder (if available). You can also find the offers and auctions here if Sweet Tooth (BC Bud Depot) cannabis seeds are on stock at MyCannapot right now. Specifics: An advancement of ST3. The BC Sweet Tooth comes down in 6 weeks or sooner with heavy yields of dense sweet-tasting candy bud. A BC Bud Depot preferred production plant, this indica is preferred by many for speedy yields of medicinal high-grade.Great for pain and relaxation. Initiation of flowering onto around 9 cm. - Final Height onto around 10 cm. DNAAA Smells like blueberries, needs adequate air circulation. Very stable during stress. Very little stretch, at 12/12 flip. Fast, not a big yielder, very potent couch lock indica buzz. Fairly funky smell at about 3 weeks in bud. Carbon filter needed. Buy Sweet Tooth (BC Bud Depot) now at MyCannapot!